Connie recovered from her intestine surgery and all went well. She returned to New Day but continued for the next year to receive chemotherapy and radiation. She has been in the CCU room here at New Day since she started treatment, away from the other children so that she can recover fully without the chance of catching an infection due to her lowered immunity. June 1, 2016 Connie finished her last treatment. A month later she returned to the hospital for tests and scans to see how her body had responded to the chemo and radiation. July 14, 2016 the reports all came in and she was pronounced CANCER FREE!!! The doctors told Grace Liu that Connie should not be alive and after Grace Liu agreed and acknowledged that she was right she replied again, saying more seriously, “No you don’t understand. There is no way Connie should be alive.” Her healing is a testament to all who know her story, including her doctors, of where the ultimate power and healing comes from. We all celebrated Connie’s life and the miracle we saw happen right in front of our eyes! August 1, 2016 Connie developed a fever. 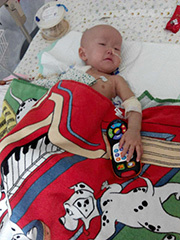 When she began to quickly deteriorate a team of doctors visiting from America and England rushed her to the hospital. When they arrived it was past 5 pm, which meant that the doctors we would want to see should have already gone home. However, “by chance”, a very good doctor was still there and was able to check on Connie immediately. We walked straight into the hospital, were taken to a very nice, private room and the doctor spoke perfect English. All of these were such blessings to us. We were so thankful to have so many doctors looking after Connie and were blown away by how we were treated and how we saw everything truly work out perfectly. 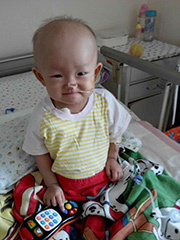 Connie was put on monitors and antibiotics and since then her fever has left her! Many scans and tests were taken but we have not received the results of the scans yet. We are not sure what caused the fever but are hoping the results will make it clear. Connie has been taken off the monitors but she is still on antibiotics. Connie is a fighter and once again beat the odds. Our prayer is that the scans come back clean and the fever does not return!! Since her release from the hospital after surgery to remove the tumor from her kidney, Connie has been recovering in our Critical Care Unit but also returning to hospital to have regular chemotherapy treatments. On Monday 3 August she was admitted to the hospital 30 minutes from New Day to have her 5th round of treatment, but as soon as she walked in the ward she vomited so they weren’t able to start the treatment. 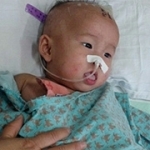 Instead they spent the week running tests and trying to find out what the problem was, and by Thursday she was diagnosed with an intestinal blockage and was scheduled for surgery in a Beijing hospital on Friday. There was a massive line of cars waiting to park outside the hospital, so our driver dropped us off at the hospital entrance and joined the line for a parking space. In the hospital, we could clearly see on the X-ray that there was a blockage in her system, from the place where the tumor had been removed. She needed to have a CT scan to figure out what the blockage was, but the hospital didn’t have a CT machine, so we needed to take her to another hospital to do it. Connie was unstable and we needed to move fast. The hospital we’d transferred her from that morning had put her on an IV to try to give her enough strength for the journey, but now it was going to take even longer. We called the driver and he didn’t pick up his phone, but when we walked out of the main doors of the hospital he was right outside, having just reached that point in the line for a parking space! Then, at the other hospital, there ‘just happened to be’ a parking space right by the entrance, which is highly unusual to say the least. We lined up to pay for the CT scan and then went to a different building to have the scan. There was no line at all, which again is highly unusual. Even right after we got there, six more people suddenly appeared in line behind us. After the scan we took her back and she was put on an IV to get her ready for surgery. Then we were able to go down to get the results of the CT scan. The films slowly came off the computer, followed by the report explaining the results. I watched Sharon’s face as she read it (I don’t read Chinese well enough). A big grin appeared. “The report says that it’s not another tumor”. It turns out that part of Connie’s intestine had been damaged, either by the massive tumor in her kidney or during the surgery to remove it. At 4 pm she had surgery and the surgeons were able to remove the damaged section. Three days later and she was out of ICU, and we look forward to having her back at New Day again soon. ‘No hope’. This is what Connie’s doctor said, in English, to Karen. The tumor that was growing in Connie’s kidney had become so large that it was pressing on her other organs and causing internal bleeding. The hospital had hoped to be able to do chemotherapy to try to shrink the tumor first before operating, but it was too late for that. Connie needed a miracle, and soon. 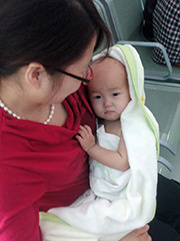 One-year-old Connie had arrived into New Day’s care on March 26, only nine days after she had been found at the gate of her local orphanage. Her abdomen was very swollen from the large growth in her kidney, and she had needed a blood transfusion before she traveled so that she would be stable enough to survive the journey. We hoped that chemotherapy would be able to shrink the tumor before she had surgery; just three days after she arrived, however, she began to bleed. We took her in to the hospital, and could see that she was in a lot of pain. A blood test showed that her blood platelet levels were dangerously low, so low that it is amazing that she survived. She needed to be admitted to the ICU, but there was no bed available so they gave her a blood transfusion and kept her in the emergency room for observation. When the doctor examined her the next day, he kept on saying how serious her condition was; she needed to be stable enough for chemotherapy and surgery in order to have a chance of surviving. All they could do was continue giving her blood transfusions. Then Connie vomited blood, and there was still no bed available for her in the ICU. It was at this point that the doctor told Karen that there was ‘no hope’. We knew that her impossible situation was a condition for a great miracle! Yet we had to make a difficult decision – to do another blood transfusion, or bring her back to New Day and just hold her? Eventually we were able to make contact with the surgeon who had successfully operated on another New Day child with the same kind of tumor, and she was willing to attempt a surgery, even though she warned that it would be very high risk. Connie was moved to the surgical ward. Connie was in such good hands. The medical team decided not to attempt to remove the tumor at this stage because she was too unstable, and instead performed a less risky procedure to cut off the blood supply to the kidney where the tumor was growing. This was urgently needed because the tumor was growing so fast, increasing by 2 cm in just two days. 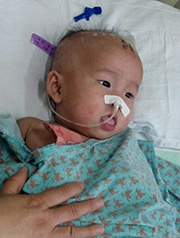 The surgery went well, and Connie was eventually transferred to the ICU after a long wait in the operating room because a bed was still not available. At this point it was a miracle that Connie was still alive, when the doctor that had examined her earlier had warned us that she would probably not survive the day, but she still urgently needed to have the tumor removed. They were not able to take her off the ventilator because the tumor was making it hard for her to breathe. Surgery was scheduled, but blood tests showed that she had an infection and her platelet count was too low. Through the Easter weekend, which happened to coincide with a Chinese holiday, Connie remained on the ventilator in the ICU, stable but sometimes running a low fever. 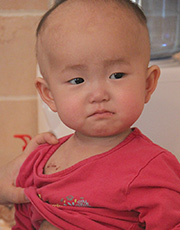 On Wednesday 8 April, Connie went into the operating room and underwent a three-and-a-half hour surgery to remove the 1.2 kg tumor. It was successful; they saw that the massive tumor had ruptured, which is what had been causing her internal bleeding. After almost a week, Connie was finally able to come off the ventilator, and a few days later she was transferred out of the ICU onto a regular ward. Connie still has a lot of recovering to do, and will still need chemotherapy to prevent the cancer from recurring. But she is alive, and her life is already proof of what can happen when we refuse to accept ‘no hope’ as a prognosis.